Discussion in 'Introductions' started by NewG73, Aug 10, 2018. Hello fellow Epi players. I’m new to the forum. So I’d like to tap into your shared wealth of knowledge. I have an AJ220s which I find very comfortable to play so was thinking of upgrading to a Texan (modern version) . They seem to look about the same size,shape etc. Slightly flatter radius 14” I think. What I don’t like about the AJ220s is mine has this new black finger board and bridge which just looks like some kind of plastic to me. Any thoughts would be appreciated. Thanks in advance. They both have solid spruce tops. The Texan has solid mahogany sides and back, while those parts on the AJ220 are a mahogany laminate. So the Texan will sound much better and the sound will improve over time, as happens with solid wood guitars. So, if price is not an obstacle, I would upgrade. But I'd probably keep the AJ220 because you can never have too many guitars. Let us know what you decide. Disclaimer - I haven't played them both, but the above is my standard reasoning on solid- v laminate-body guitars. NewG73 and Supersonic like this. I have both, the Inspired by '64 Texan is definitely a step or two better sounding, unplugged. A little brighter with more projection. But where it really shines is when it's amplified. The Shadow Nano-flex system does a great job, in my opinion. I got a nice used one, with case, for under $375 and couldn't be happier. Best sound acoustic/electric fro the money. The AJ-220S hardly ever gets played, except by friends, when they come over. There are a couple up on the bay, for under $400 (one with free shipping). Davis Sharp and NewG73 like this. I have a Texan. It's a very nice guitar. Recently, they increased the price of them significantly (from $399 to $479). It's a great guitar for the old price, but unless they did some big improvements I'm not sure it's worth the new price. At that price range, it starts to open up to some of the Epi Masterbilt series and even some "better" brands. I was lucky and got a great deal on mine ($239 on clearance). If you can swing something like that, don't hesitate! Also, be advised that the "Antique Natural" color is kind of an orange color. It takes a little getting used to. If you can see one in person first, I'd recommend that. NewG73 and Davis Sharp like this. Look, I put a tape on both, in about 20 different spots. They measure identical, which surprised me a little. The tapered body thickness, in side-profile appears (and feels) slightly slimmer on the Texan, but it isn't. The 220 neck feels a little chunkier. but it isn't. I can tell you that even after spending some cash on the AJ220S, in set up, the Texan just plain sounds and plays better. And, it's A/E. If you like the 220, you'll love the Texan. 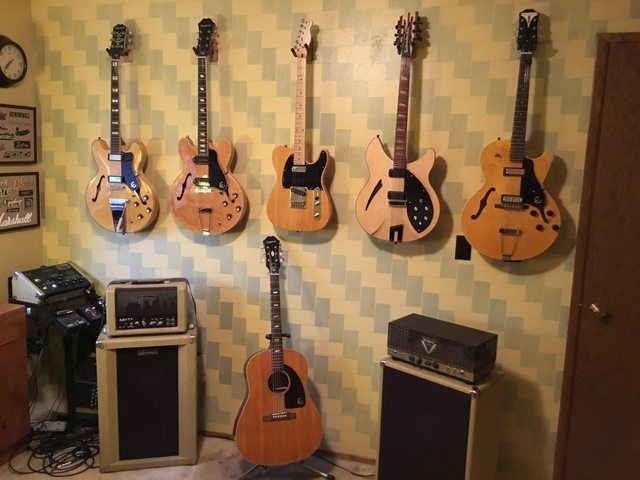 My luthier is a Gibson and Rickenbacker tech, used to nice, high end guitars. He bought a Texan after playing mine, when I took it in for the obligatory post sale "set-up". He was surprised at the quality, for the price. It's his "go-to" travel guitar, now. I agree with the previous comment on color, if you're picky, look at it in person before purchasing. I've seen some that get a little wild, if you are used to a natural finish. NewG73, Raiyn and Davis Sharp like this. Also, be advised that the "Antique Natural" color is kind of an orange color. It takes a little getting used to. I agree with the previous comment on color, if you're picky, look at it in person before purchasing. I've seen some that get a little wild, if you are used to a natural finish. Wild, you say? Color me intrigued. As you may, or may not know, I prefer natural colored guitars. When I became interested in a Texan, I had to look at a half dozen of them before finally buying one. Most were definitely on the orange sunset side of colors. This one was fairly close to what I had, already. As you may, or may not know, I prefer natural colored guitars. Yeah, I'm aware of your predilection for "bare" finishes. Comparatively speaking, it is a bit different. Ok thanks for all this advice. I’m away working at the moment. Home next week. I’ll be having a good look around a few stores to try some out. Looking online to while I’m away too. If the natural is not to my liking, the cherry burst looks good.